Then she made...: Epic Fail! It's hard for me to admit this but it's true, I failed. As in epic fail! I don't know about you but I have this un-natural belief about myself that I can do all things. The fact is, I can't. But, I don't always believe facts, do you? My husband points out every time we grocery shop that I'm not Wonder Woman. He's not being mean, he's just stating the facts because I try really hard to carry all the groceries into the house in one trip and it drives him crazy. I'll carry 10 bags all at once while he carries 2. And, if there is room on my pinky finger, well, I can grab his bags too. This is a good analogy for the rest of my life too. I usually think I can do it all and do it all at the same time. And not only do it all but do it all equally well. This past week though has given me a reality check. If I was being graded on getting things done among chaos, well, I would have gotten an F! So, what did I fail on? I'm really sorry but there is not going to be a June Nativity! My intentions were good but with the craziness that hit and the things that are coming up I realized I can't do it. I'm going from dealing with funeral to a wedding both in the same week. Doesn't that seem like a cruel joke? Oh, and let's add a birthday in there too. As you know the funeral was for a family friends who lost their 17 year old son, and while my role was minimal, there was a lot to be done behind the scenes. I'm the secretary for the women's origination at my church so lot's of phone calls, lots of emails, and lots of coordinating this & that was going on. There were others who did way, way, way more than me and I'm blown away at what they can handle. I learned a lot from watching and working with them. Anyway, June's piece was going to be the Camel. He is the hardest part of the Nativity. I thought June would be a great month to do a hard piece. It's the first month of summer, we are all kicking back and have nothing better to do, right? Ya, that thinking didn't work out so well for me. So, here's an idea.... If you are following along with these monthly tutorials than you've probably already made the three wisemen right? 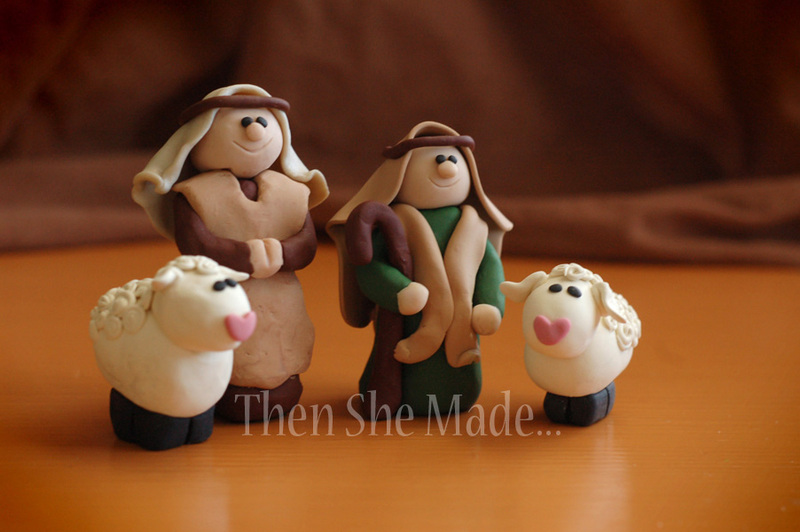 Well, if you really, really want to get a piece done this month and are a visual person, you can probably look at the Wisemen and put together a Shepherd pretty easily. You follow all the same steps as the Wisemen, use tin foil for the body and head, add the clay, etc... They are the same height and have the same faces. The major difference will be in the clothes and colors. Shepherds are humble so use muted colors like various shades browns. The photo at the top of the post is from a Nativity I made two years ago. 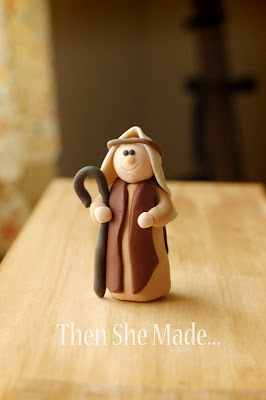 The photo below is the Shepherd we were going to make in our tutorial. I will still do the tutorial but it's not going to happen in June. Anyway, if you want, try it without the step-by-step. If you don't want to do that, just hang tight. Hopefully the month of July won't be so crazy. Sorry to have failed all my Nativity Clubbers. Hang with me though, we'll get all 12 pieces done. But for now, I'm off to prep for the wedding I'm helping decorate. Oh, and grocery shop - maybe I can carry 12 bags today. P.S. - thanks for your comments, emails and prayers. Your support and encouragement over the past week have been inspiring. One fact I do believe is that I have nice readers! I have been following along with your tutorials every month and you are right, I would have been overwhelmed with the camel, but the shepherd is doable so I will be doing that today and delivering tonight. Thank you do much for taking on this commitment. It has been lots of fun and some stress. Hang in there! Amy, you have simply re-arranged your schedule. It's NOT failure. You put too much pressure on yourself. We're so blessed to have you share this with us - you could simply say "check my Etsy Shop". I have wanted to try using clay for some time now and you have given me the courage to try. I so enjoy seeing what you have done. Thanks for sharing the gifts the Lord has given you. Don't even think twice about it. Life gets in the way of good intentions. It was much more important for you to be there for those who needed you this week. Everything will work out. We are all thankful to you for sharing with us. Amy-You have not failed!! Jsut postponed a little bit. You surely heard the saying-Want to make God laugh? then make plans! I collect nativity scenes and every time you post the next figure, I tell myself that i need to go and buy clay and make the figures-but haven't gotten to Hobby Lobby or Michels yet. I feel for your friends that lost their son. May they (and the rest of the church family) find strength and comfort from our Lord God. Take care of yourself and don't forget to breathe! And like Sharon said above, thanks for sharing with us! You haven't failed!! What you have done is respond to far greater priorities than putting together a Nativity figure blog for us. Had you said to that young man's family "Sorry, I can't help you through your loss - I have to put out a blog about a camel. ", then you would have failed. The message of The Nativity isn't clay figures but love and that's what you've demonstrated to them and to us. When the time is right, we can all make the camel in memory of the young life that was cut short. Our Nativity scenes will be richer for it and he will live on in all our homes.